From the incredible ancient temple vistas of Angkor Wat to remote river towns, travel the Mekong into the heart and soul of Southeast Asia. Laos and Cambodia combine cultural treasures and natural splendours with characterful transportation and accommodation. A host of optional activities on this trip also lets travellers craft their own perfect adventure. Travel from Bangkok into Cambodia to Siem Reap, gateway to Angkor Wat. As well as a guided tour of the site's legendary temples, you can visit a nearby floating village while enjoying traditional Khmer food with a local community. Moving on to the Cambodian capital Phnom Penh, you can get a distinctive experience of the city with a cycle tour, alongside guided visits to the haunting Choeung Ek (Killing Fields). Make time too for the Royal Palace, National Museum or Russian Market, before heading to Kratie for an (optional) boat trip to see the fabled Irrawaddy dolphins. Crossing into Laos, Don Khong offers a chance to experience village life or just relax by the Mekong. Enjoy a guided tour of Wat Phu Champasak, plus a traditional homestay in Don Deng. Discover one of Asia's most charming cities, meanwhile, in Luang Prabang - watch saffron-robed monks seeking alms, visit the Ethnology Museum and Kuang Si waterfalls or just test out Laotian-style massage! There are plenty of active adventure options next in Vang Vieng – but also plenty of characterful cafes if you just want to kick back and soak up the vibe. Your final destination is Ventiane, Laos' pleasing capital, where you can visit temples and shop in colourful markets for last chance souvenirs before boarding the train back to Bangkok. 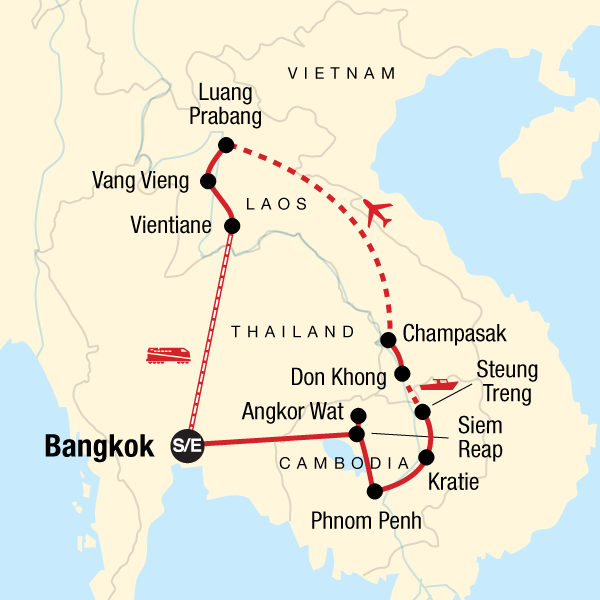 Low Impact Transportation: This trip gives you the chance to try out the local bus from Siem Reap to Phnom Penh and overnight sleeper train from Nong Khai to Bangkok, opotion to do a cyclo ride around the center of Phnom Penh and using the local tuk tuks to get around in Phnom Penh and Siem Reap. Getting around as the locals do not only allows you to experience the culture on a deeper level, but the same way it is at home, using public transport is the most sustainable way to go – after walking and cycling of course! Supporting local culture and businesses: There are a multitude of opportunities to support local businesses and immerse yourself into the culture of Indochina on this trip. From the colourful markets to the bustling food stalls and cafes, the choices for eating and handicrafts are endless and the money is staying in the local economy - a vital way for tourism to make a positive impact. Activities that take you to markets, locally-owned restaurants, locals’ homes and villages are vital to the local peoples’ ability to truly benefit from tourism. Our style of trip, travelling, eating and staying with the locals, puts you right at the heart of the culture in Cambodia, Lao and Thailand. In Siem Reap you will have the chance to visit New Hope, one of our Planeterra projects in Cambodia, in south of Laos we stay overnight in a traditional home stay and enjoy local meal on the island of Dong Deng. In all the places we visit you have the chance to explore local restaurants, coffee shops and market stalls where you can meet local people. Chatting with the locals will give you an amazing insight in local life. It may not be apparent that learning about and respecting other cultures is part of being a responsible traveler, but we believe that this discovery is a natural way for people of all backgrounds, nationalities, and religions to interact and learn from each other, fostering peace and understanding. And it’s just plain fascinating! Other optional unique experiences on this trip that allow you to support the local economy and learn about the culture in Cambodia, Laos and Thailand include: Visit Toul Sleng and the killing fields in Phnom Penh and learn more about the Khmer Rouge, an optional boat trip to see Irrawaddy dolphins in Kratie, beautiful bike ride on Don Khong island, get up early in the morning on Dong Den or in Luang Prabang to see the monks collect alms. Spend some time on the river side in Phnom Penh in the afternoon seeing local people doing excersice, arobic of just enjoying them self with family chatting, playing and having a picnic.